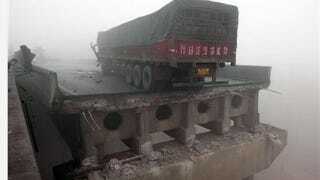 A horrible thing has happened today in China's Henan Province. A truck loaded to the gills with fireworks—intended for the country's upcoming Lunar New Year celebration—fired off its wares on a busy highway, leading to six minutes of the most brightly lit, celebratory destruction in recent memory. How bad was it? According to the AP, the boom took out a 260-foot stretch of elevated highway, sending cars in a 100-foot freefall to the ground. Two dozen cars are totalled, at least eight people are dead, many more injured, and the dust literally still has yet to settle. Investigators still aren't sure what caused the maelstrom in the first place, but at least one thing's certain: this was an awful event, made all the more so by how bright and booming it must have been.